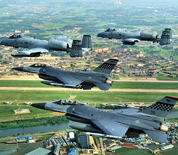 Osan Air Base is located in Pyeongtaek, South Korea. The 51st Fighter Wing of the Pacific Air Force serves as the host unit. The headquarters of the Seventh Air Force and the Republic of Korea Air Force Operations Command are also located at Osan. The mission on base is to provide defense for the Republic of Korea, using A-10 Thunderbolt IIs and F-16 Fighting Falcons. This Osan AB directory features the critical info you’ll need to navigate through the many facilities and recreational opportunities available on base.